Search the world of crowdfunding and you’ll find hundreds of different tracking devices. Companies like Pile opened up the floodgates for anyone who could package together a bluetooth enabled tracking chip and muster up some code. Literally between just Indiegogo and Kickstarter alone there are 40+ projects in that domain. So why should you care about Total POM? Well POM stands for peace of mind and that’s exactly what you’ll get when you back and preorder the system via Kickstarter. Why does it give you peace of mind though? For starters Peter Johnson, the inventor of Total POM has been working in the space for nearly a decade. His company has created tracking devices that can be used on freight containers, including complete metal boxes, a feat impossible before his technology. Johnson’s company helps track millions of products shipped around the world every year. So when similar technology began to catch on in the consumer market Johnson knew he could create a reliable, feature packed product. Work began on Total POM two years before Tile even hit the market. Admittedly tracking chips to find your keys, your iPad or your pocketbook are quite useful, but when you want to deploy a device like this for personal safety or the safety of your kids or pets you want to make sure that you’ve got the best of the best. 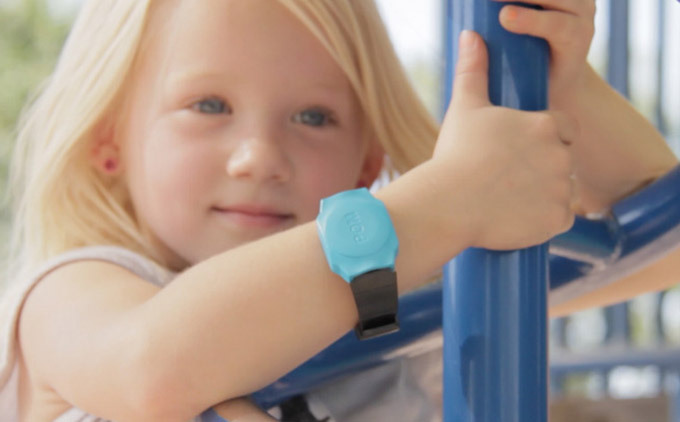 There are hundreds of uses for Total POM but some of the more important uses include using a POM wristband with the POM device to keep track of your children whether they’re in the backyard, the school yard or the playground. POM can be affixed to your dog’s collar as well, so next time Brutus goes chasing the mailman you can find him quickly. Total POM can also be used for home safety and security. Johnson was featured on ABC on the Fourth of July to talk about pool safety. 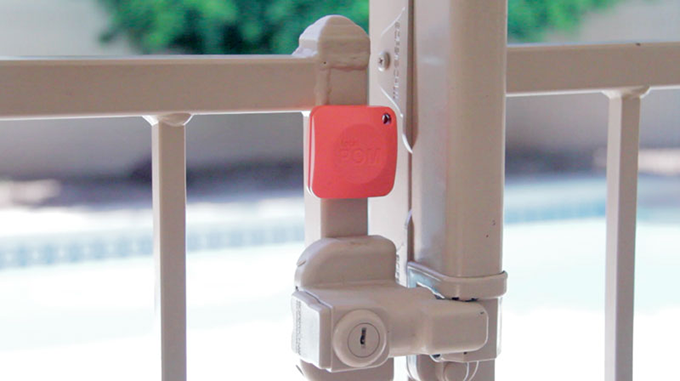 Total Pom can be attached to the pool gate and let you know if your pool gate has been opened. In an interview with Techfaster Johnson disclosed that they’re working on a submersible Total POM device that could be left in the pool and detect the vibration of a body falling into the water. Do you have a gun cabinet or an important drawer, cupboard or closet. Sure you lock those things up but Total POM would give you the peace of mind of knowing if those things were ever opened. If it seems like Total POM has everything totally figured out, that’s because they do. Their years of experience in the industry means that their devices meet stringent standards and have useful feature sets. While many tracking projects on crowdfunding sites need to navigate the manufacturing waters after their campaign finishes, which can add months to delivery time, Johnson and his team have been manufacturing for years. The manufacturing is already set up and ready to go as soon as their Kicsktarter campaign finishes successfully. And yes Total POM can be used for your valuables as well, especially those irreplaceable people and pets in your life. Back Total POM here.